Designers, contractors and installers will see that BB101 has toughened its approach to several areas. There are more stringent air quality targets; tougher rules on summertime overheating; and a strong focus on avoidance of draughts. The elements of IAQ, thermal comfort and energy efficiency must be carefully balanced under the new rules. The government’s approach sets the bar high for performance of ventilation systems. Classroom guidelines include maximum CO2 limits which cannot be breached for 20 consecutive minutes. 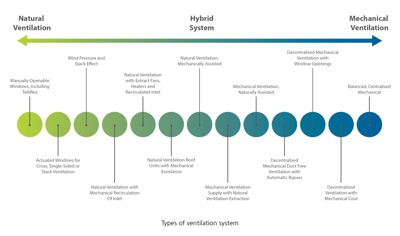 BB101 2018 also introduces hybrid ventilation systems along with the traditional natural and mechanical ventilation approaches – which gives designers another option to consider. Overheating is also in the sights of BB101. Full occupancy is now to be assumed throughout the holiday period. 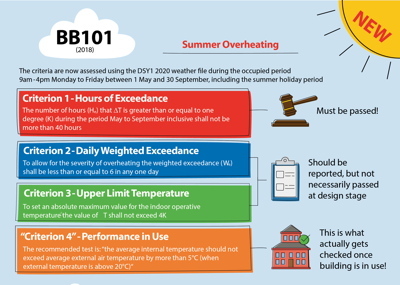 And the rules state that there should be no more than 40 hours between 1st May to 30th September when the temperature is 1oC above the allowable maximum.